For the most part, Webster’s fears have come to pass. Considering the fact that Congress’s approval rating averaged out at an all-time low of 14% in 2013, I think it safe to say that most any American citizen, regardless of their political stripe, would consider themselves to have been more or less duped by the designing men (and women) of Washington. However, I believe that a sizable portion of the American electorate would acknowledge that much of their own political inattentiveness is the result not of confidence in their representatives in government, but of a heady mixture of apathy and disillusionment that those representatives cultivate within them. In fact, for many of us, it is precisely the proper scrutiny of the (mis)conduct of our elected leaders that breeds such willful inattention because, after awhile, not caring seems a more palatable alternative than caring deeply and being able to do nothing about it. Luckily for the American people, the idea that there is nothing we can do about the political and socioeconomic course of our county is just that…an idea…and a false one at that. It is an idea propagated by those who are so deeply wedded to the status quo that they have become hopelessly enamored of it and by those who wish to be rid of the status quo, but have lost the ability to imagine a world in which it does not exist. If there is one silver lining to the chemical spill that occurred in West Virginia earlier this month and which continues to leave hundreds of thousands of people without access to clean drinking water, it is that it has unearthed a vast network of ordinary folks who are willing to sacrifice their time, their energy and their checking accounts to help those who are suffering, even when pretty much no one else can be bothered to give a damn. The collective yawn of Washington was evident from the get go, with Senate party leaders failing to take any time in the regular press briefings to so much as acknowledge the fact that thousands of gallons of a largely unknown chemical had polluted the water supply of over 300,000 American citizens. The national news media largely gave West Virginia the cold shoulder, with neitherNBC, ABC or CBSdevoting a single second of airtime to the crisis developing in Charleston. Even the state’s own governor, Earl Ray Tomblin, seems to have lost interest in the welfare of his constituents telling them that it’s their decision as to whether or not they use the contaminated tap water. However, in spite of all of this neglect and disdain, thousands of West Virginians (and many more from outside of the state) have taken action, using organizations like the West Virginia Clean Water Hub to provide people with the clean water and sanitary supplies they need and that any government worth a damn would be providing. Thus, we come back to the question of why it is that our government isn’t providing all of these vital services to the American people, and this is usually the time that the partisan bickering and frothy-mouthed diatribes start a-rolling in, causing a chain reaction of events that leads me, at any rate, to that deep, dark place where all political action seems hopeless and where I become convinced that the bought, sold and spoken for politicians who run this country will never be ousted. But this time is different. This time I will not rant and I will not rail against these horrendous affronts to representative democracy, but I will diagram, by way of a succinct and comprehensive look at Senator Joe Manchin’s (D-WV) relationship with the chemical industry, why it is that the status quo never changes and why it is that the people of West Virginia, and all 49 other states, seemed doomed to live the same catastrophes over and over again. This type of analysis can in all likelihood be done with most members of Congress and a plethora of issues, but I’ve chosen Senator Manchin this time around because his actions perfectly illustrate why it is that West Virginia’s political establishment will enact no meaning legislation with regards to water safety and why this sort of chemical spill is bound to happen again. As always, the reasons behind these realities begin and end with money. Between lobbying, campaign contributions, tax reform, political appointees and lucrative government contracts, there are plenty of opportunities for the almighty dollar to worm its way into the hearts and minds of our elected officials. In the case of Joe Manchin and The Elk River Chemical Spill, we’ll start off with campaign contributions. While he may be a relative Congressional newbie, Manchin has taken no time at all to get acclimated to the big leagues when it comes to fundraising especially with regards to the special interests that have controlled West Virginia for pretty much its entire existence as state. 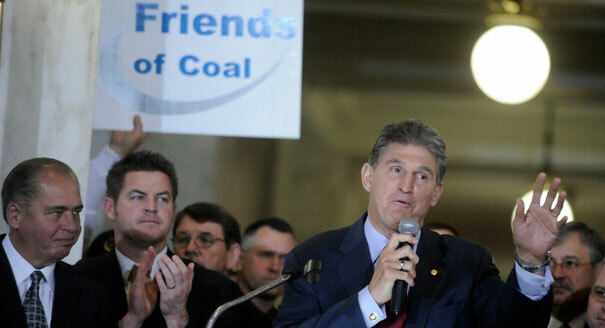 Just between 2009 and 2014, Manchin has received a staggering amount of money from individuals and PACs representing the West Virginian energy triumvirate of Mining, Electrical Utilities and Oil & Gas, raking in $1,339,898 between the three sectors. However, our interest in this particular case doesn’t lie with these gaudy numbers, but with the comparatively small contributions that Manchin has received from the Chemical sector. Since 2009, Manchin has received $95,000 from Chemical and Related Manufacturing sector, a pittance compared to what he gets from big coal, but a substantial amount of money nonetheless. Unlike the three heavy hitting energy sectors that I mentioned earlier, Manchin’s contributions from the Chemical Manufacturers came predominantly from Political Action Committees (PACs) rather than from individuals, and it is with one particular PAC, EastmanPAC, that we want to focus our attention. EastmanPAC is the PAC that was formed by Eastman Chemicals, a Fortune 500 company based out of Tennessee that manufactures a wide array of chemicals, fibers and plastics including 4-Methylcyclohexane Methanol (MCMH), the organic chemical compound that was unceremoniously leaked into the Elk River and is usually involved in washing off all of the waste particles that cling to newly mined coal so it can burn more efficiently and cleanly and be worth more money. The fact that it is Eastman Chemical that is responsible for the manufacturing of MCMH is particularly prescient in this instance because EastmanPAC had given Manchin $11,000 during the 2010 and 2012 campaign cycles. Now, keep in mind, this money did not come from individual contributors who have a vested interest in who represented West Virginia in the US Senate. No, this came from a Political Action Committee that was formed by Eastman Chemical, for Eastern Chemical, with the sole purpose of its existence being to give money out to federal political candidates. I don’t know about you, but if a Fortune 500 developed a PAC just so that they could give me $11,000, I’d be willing to bet they wanted something in return. Enter the Chemical Safety Improvement Act (TSCA), a piece of legislation which was designed to reform the Toxic Substance Control Act, which was initially passed back in 1976 and is very clearly inadequate to regulate chemicals in the 21st Century. Manchin, who is a co-sponsor of the bill, began presenting the bill as the regulatory answer to spills like the one that happened at Freedom Industries. In a vacuum, it would seem as if this was a step in the right direction. After a tragedy occurs, a Senator in a regulation wary state begins stumping to modernize an outdated piece of legislation to keep his constituents safer. But, this isn’t in a vacuum. This is West Virginia, and in West Virginia it is par for the course present legislation for chemical regulation one day, and then attend a fundraiser for American Coalition for Clean Coal Electricity and antagonize the Environmental Protection Agency the next. Thus, it should come as no surprise the Chemical Safety Improvement Act might actually weaken the already anemic regulatory allowances made by the current law and has the enthusiastic support of The American Chemistry Council, the trade association for American chemical companies like Dow, Dupont and Eastman. In fact, Eastman was so fond of the Chemical Safety Improvement Act, that it spent $120,000lobbying on its behalf in 2013. Even a cursory look at the legislation will provide a pretty good idea about why Big Chemical is so keen on it. According to the Chemical Safety Improvement Act, all chemicals would be divided by the Administrator of the EPA into two categories, “high priority” and “low priority.”The high priority chemicals would be subject to a safety assessment and determination. The low priority chemicals would not be subject to any testing. Under these guidelines, the EPA would likely categorize MCMH as a low priority chemical. Senator Manchin’s legislative answer to the Elk River spill wouldn’t even cover the very substance that started this whole reevaluation of our chemical regulatory practices in the first place. If you want a simple and enjoyable way to help out the people still struggling to get clean water in West Virginia, come on down to my Indiegogo fundraising site for the 1st Inaugural Mountaineer Bad Beard-Off Challenge. I’m trying to have as much fun with it as I can and am donating all of the money from the drive directly to the Keeper of The Mountains Foundation who works with WV Clean Water Hub to get water and sanitary supplies out to folks all across the areas affected by the spill.